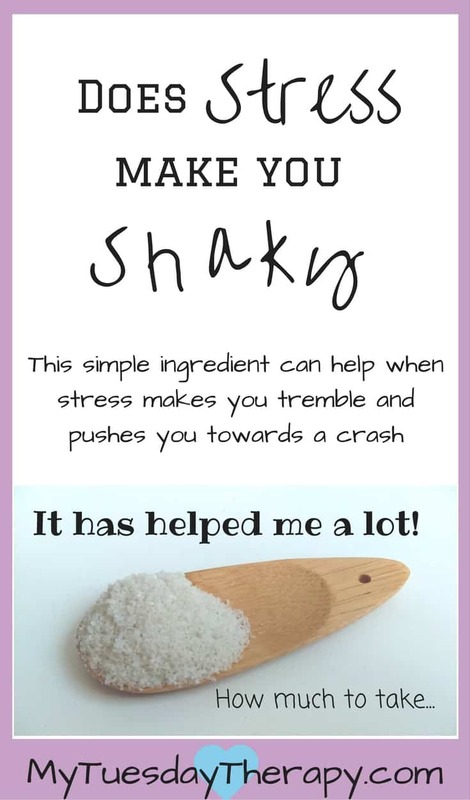 How about some sea salt to treat your adrenal fatigue? I craved salt and decided to satisfy that craving. Salt is not always bad for you but it has to be the right kind. And I especially needed it when I had a severe adrenal fatigue. The more advanced the adrenal fatigue the less salt you retain. The adrenals don’t produce enough aldosterone to maintain the sodium level in the body. This post contains affiliate links. I’ll get a small commission at no extra cost to you, if you choose to purchase through my links. What did I do to bring up the sodium level? Ate salt! I salted my food to taste. And drank salted water. Yes, that’s right. I started drinking ½ tsp in 1 cup of water in the mornings. And an additional ½ tsp to 1 tsp in the afternoon. Some are sensitive to salt so I checked my blood pressure for a few days to see whether I’d react to it. I didn’t have any problems with it. I noticed that when I had more stress than usual, like having dinner guests, I needed to up the salt amount I drank. The interesting thing is that your body lets you know when you had enough. The same amount of salt in the water starts tasting too salty. In those more stressful situations and after them, I barely tasted the salt in the water! Too much of it can also make you nauseated. I used to carry salted water with me when I had to be away from home for a few hours. (Because being upright and moving put a lot of stress on my body). I also had a tiny bag of salt in my purse in case I needed to quickly put some on my tongue or add to my food. I still occasionally start my day with salt. 1/8 to 1/4 tsp in 1 cup of water. Sea Salt is rich in minerals. An easy way to add those important nutrients in your body. Sea salt helps, among other things, to balance your body’s pH levels, regulate water levels, remove toxins, and improve digestion. According to Lung Institute, salt is also antibacterial and anti-inflammatory. I use Pink Himalayan Salt by San Fransisco Salt Company. I started out by taking Himalayan Salt by Premier labs but switched to the other one because it is cheaper and yet good quality. For cooking I use either the Pink Himalayan Salt or French Grey Sea Salt. I thought about adding some high-sodium vegetables like kelp, beets, celery, and green olives in my diet but besides beets they don’t sound appealing to me. Before I started the salted water routine, my sodium level was 136 (mmol/L) and potassium 3.9. It took me for a while to get my sodium up to the level my doctor and other sources, for example Stop the Thyroid Madness, recommended it should be. My latest labs showed sodium level of 141 and potassium 4.1. Enjoying salt I was able to ease up the afternoon crashes 🙂 . Lung Institute. Salt and COPD. Wilson, James L. Adrenal Fatigue: The 21st Century Stress Syndrome.